Call history can disappear from iPhone for several reasons. It can disappear due to fatal contacts settings, virus attack, or a temporary issue. If you re sure your lost call history has already been overwritten after losing, then there is no way to recover call history from iPhone directly. However, if you have backed up your device to iCloud once, follow this post and learn how to recover it from iCloud. How would you like to recover call history from iCloud Backups with or without data loss? Obviously without data loss. Well, this is achievable only by using a third-party iPhone Data Recovery Software. When it comes to iPhone data recovery, iMyFone D-Back stands out of most iPhone data recovery programs available in the market. 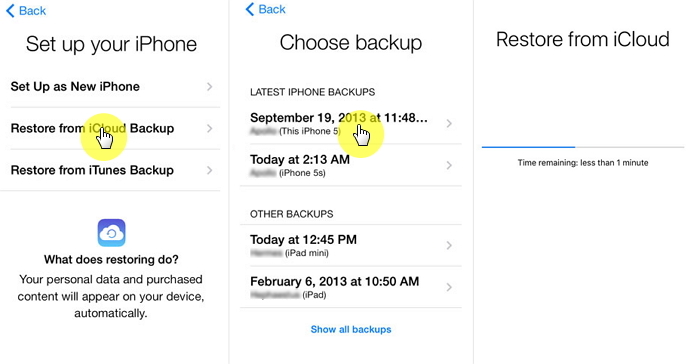 iMyFone D-Back allows can help you recover call history from iCloud Backups without losing a single bit of data. In addition, iMyFone D-Back is compatible with all iOS devices and versions including the iPhone XS Max/XS/XR and iOS 12 - recovering data based on advanced rollback technology. It can recover call history from iCloud backup selectively or fully. It allows you to view the call history in iCloud backup before recovering. It can recover call history from iCloud backup without restoring. It can recover call history from iCloud backup without affect current data. Note that this step only works if you have made the iCloud backup prior to losing the call history from iPhone. 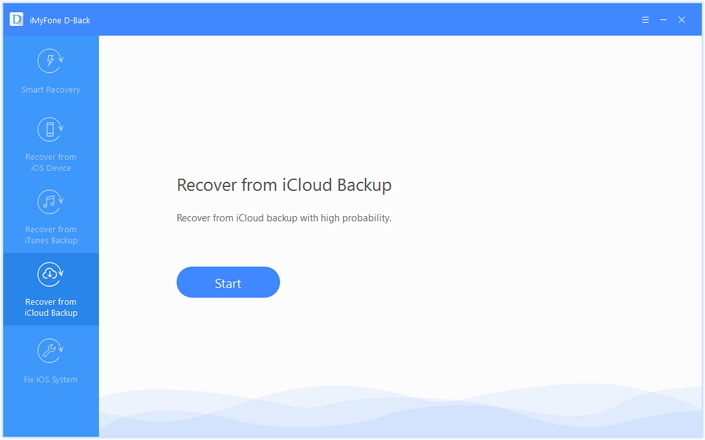 If you have an iCloud backup available, the below steps can easily let you recover call history from iCloud Backup using iMyFone D-Back with no data loss. Step 1.Download, install and open the iMyFone D-Back software on Mac or Desktop PC. Click “Start” after going to the “Recover from iCloud Backup” tab. Step 2.D-Back will ask the iCloud login credentials. If you’re concerned about entering iCloud login through iMyFone D-Back, note that iMyFone never keeps the user data or account info. Step 3.After logging in to iCloud, it will show you a list of iCloud Backups made on the iPhone. Select the most relevant one by checking the date and time. Click “Next”. Step 4.Select “Call History” under the “Message & Call Log” field and click “Scan” to proceed. Step 5.After the scan is completed, you can preview the files from the iCloud Backup. Click what you need and click “Recover. Following the above steps, one can recover the deleted call history from iPhone within a few minutes. Unlike most data recovery software, D-Back offers a quick scanning time. Step 1. Before restoring the device, make sure to check if the device has a recent iCloud backup. You can check the iCloud Backups at Settings > Your Name > iCloud > Storage > Manage Storage > Check the date and time of the recent backups. Step 2. If the backup is available, open “Settings”, tap “General”, and then select “Erase all Content and Settings” from several options. Step 3. Enter Apple ID to confirm the factory restoration decision. Step 4. Set up the device and tap “Restore from iCloud Backup” at the “App & Data” page during reboot. Step 5. Sign in to iCloud. Step 6. Choose the most relevant backup by tapping “Choose Backup” and complete the process. Both the pros and cons of the two methods described above are obvious. 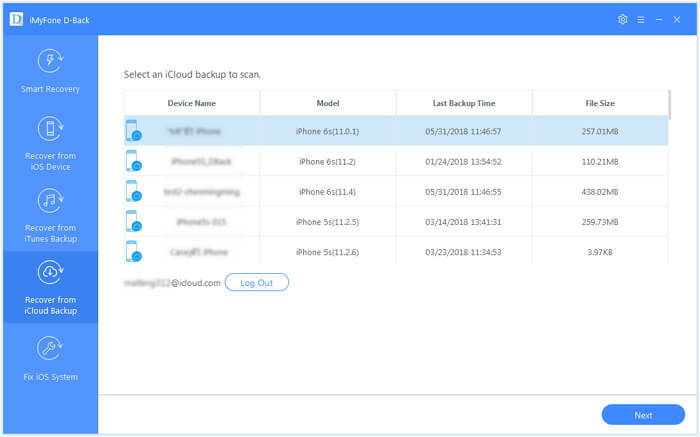 While the iMyFone D-Back lets you recover call history or any other data type via iCloud Backup without data loss, using the iCloud Backup restore process involves data loss. Which means you will have to factory reset the entire device and its content to get back your call history. To combat data loss issues while recovering call history via iCloud, you can either use iTunes or iMyFone D-Back to save your data locally. There is no storage limitation like iCloud. Please note that the iTunes does not allow you to view the backup content. So you can try D-Back as alternative. Call history is an important part on every mobile device and losing it can hinder our personal as well as official activities. The above solutions to recover call from iCloud can certainly solve this problem. Overall, using iMyFone D-Back to recover call history via iCloud is the best option as this method does not involve the iPhone factory reset and data loss. 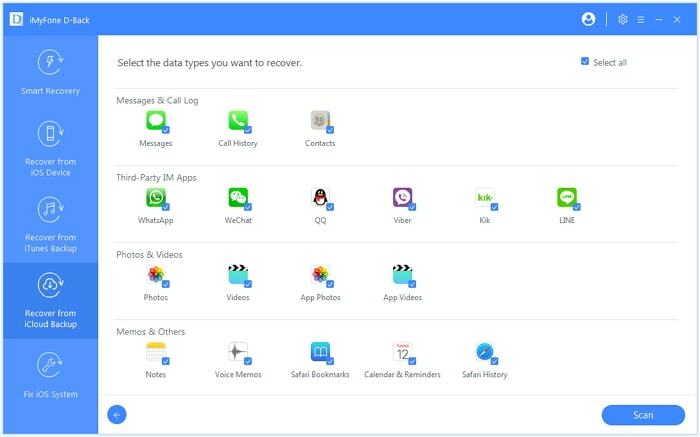 You can specifically recover the call history without touching any other data type. In case of further questions, feel free to leave a reply below.